I had decently long hair and I really don’t know how it happened. One day it was at my shoulders and then it was at my waist. I was like, dude, calm down! As it grew, I became more and more attached to it. It came in handy that I didn’t need to do much to “do” my hair as I am lazyyyy when it comes to that part of beauty. I will spend an hour on my makeup, but no more than 10 minutes on my hair. Top buns became my favorite friend. Messy low buns and side ponytails were always the perfect backup. It was also great at hiding my face if a breakout was happening. serves the purpose of showing my hair's wildness. I used to be pretty impulsive with my hair: from dying to cutting, to even creating pigtails out of chopsticks. I’ve had a-line bobs, multiple colors, and bangs to name just a few. And these would happen within months of each other. Then I hit 21 and adulthood was on the horizon. 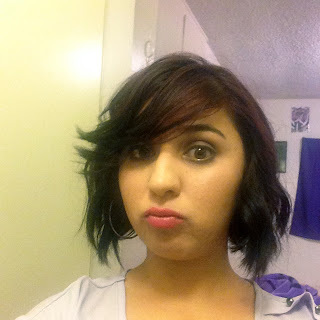 I needed normal hair in the real world, so I dyed it dark brown and let the layers grow. Different hair styles from the past 6 years. Ah, girls and their hair. Hair is synonymous with femininity and desirability, not sure why but it just is (because the Patriarchy that's why!). From dad’s forbidding their wives and daughters from even entering salons (yeah, it still happens) to the “butch” and “lesbian” slurs when the pixie cuts appear in the room, this is an old problem in feminism. The policing of women's hair has been yet another tool for people to control them. And when you add race to the question, well just look up the testimonies of girls dealing with "natural hair" on blogs and YouTube. Lately, I had been itching to hack it all off. I wanted to take off the weight, but not just literally. I was becoming increasingly uncomfortable with the ~sexiness~ attached to my hair. I wanted to spite all the people that congratulated me on the length, which basically translated to "Yes good, you are an acceptable girl now. Not like you used to be”. My hair was pulling me down. The longer it got, the more I hid in it. Feminists have documented this hair dilemma for a long time, it's nothing new. Do a Google search for "feminism and hair" and you will get a reading list to last you the rest of summer. Most of us don't really think of hair as a political statement, but it definitely is. From girls cutting it off during personal crisis to punks with liberty spikes, the hair on your head (and everywhere else actually) is a huge political and public statement. Just remember, you never want to be solely defined by it, well at least I don't. So I cut it. Hair grows back anyways. Despite the face, I'm actually happy about this new cut. Also, I'm wearing the new awesome Urban Decay Revolution lipstick in Turn On. P.S. I wish I would have come up with this blog title in college, I would have written my thesis on hair just because of it. Great post, Angie! Glad to see you took the plunge into the world of the cropped 'dos. I approve.